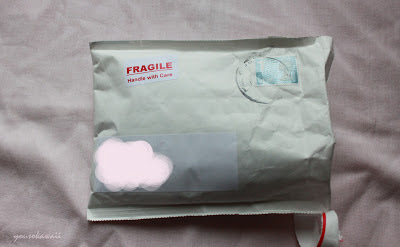 When I opened it my two chokers were packed in seperate mesh bags with extra goodies inside (I'll get to those later) and I just love little touches like this it made me really happy. There was also a little thank you note. 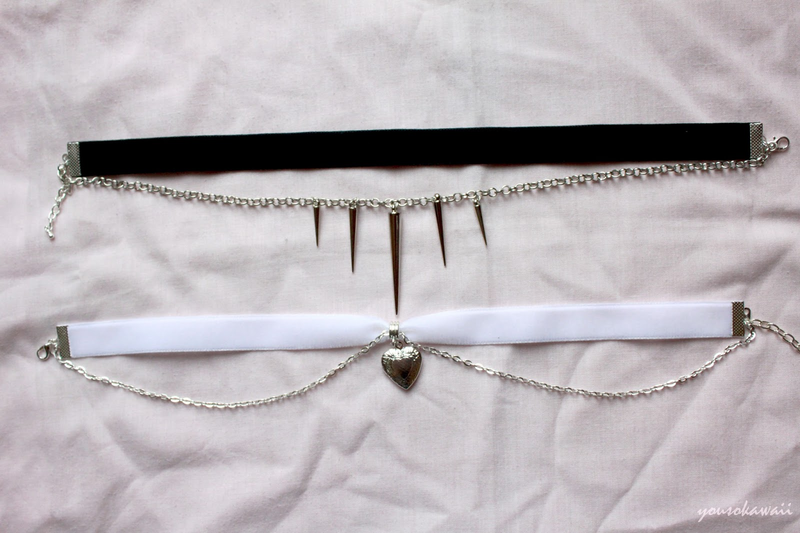 So these are the two chokers I ordered, this and this one. The spiked one was slightly too long so make sure to ask for a smaller one if you have a small neck like me. I just really love them so yeah. This photo shows more of what the chokers look in real life. They're quite bright and very light. Firstly there's this lovely white one, this was £4.99 and I am glad I chose this one. Sorry I edited these pics a lot the ones before show more of what the necklaces look in real life. This is comfortable and I can't decide whether I want to adjust it to be a little smaller or not. I'll probably keep it as it is. Anyway the velvet is super soft, it doesn't scratch and on this one the locket opens. Don't know what you'd keep in there but still; it's cute. 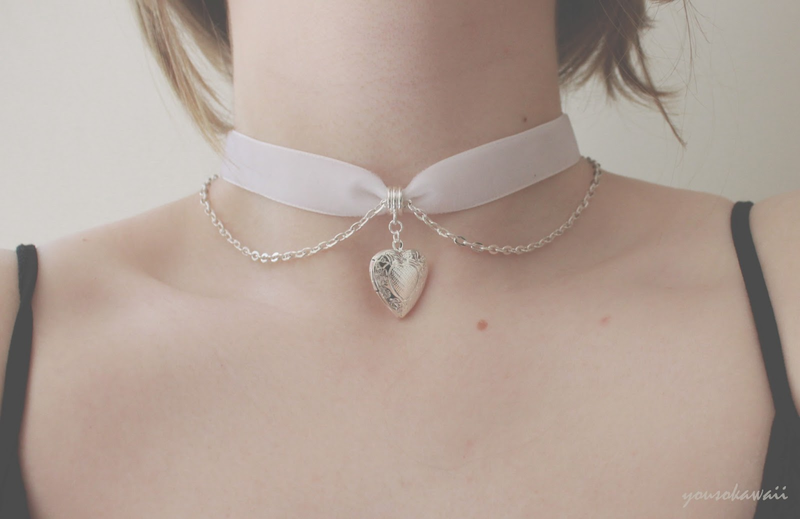 I liked this in black but with the heart and chains I thought it looked super elegant in white and it does. Next there's this, it cost me £3.99 which I think wasn't bad at all. It's super cool and I kind of feel like a 90s goth wearing it. Need to match some clothes to go with this. The only down side I have to this is that when I got it it was too long. I mean I have a small neck and should've checked the lengths but if you do have a little neck like me make sure to ask if you can get a smaller size. The picture above is of it after I'd shortened it so it fit (it's not hard to do but best if you don't have to). 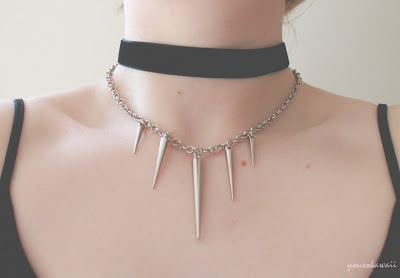 The spikes are really light and you barely feel them on you at all. The choker is a little uncomfortable at first but I'm getting used to it and it's kind of a nice feeling now. These are the freebies she sent me, the two on the left came with the white choker and the one on the right with the black one. 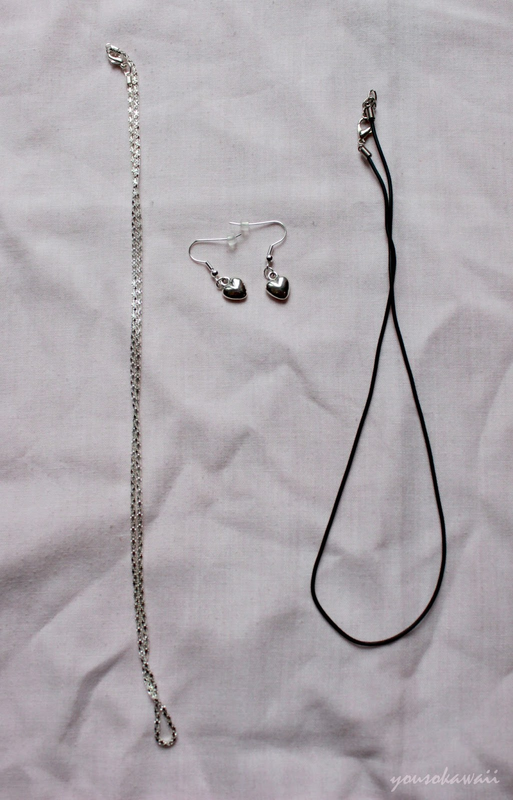 The chain on the right is really weird but cool, the earrings are cute. 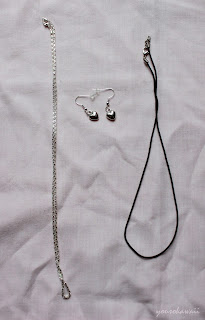 The chain on the left is just a simple rubber black chain, but handy and I'll definitely find a use for them. Be sure to check out the shop.